Agriculture has always been a big part of my life and I knew from early on that I wanted a career in the primary sector. I started at Massey as a pre-vet student. 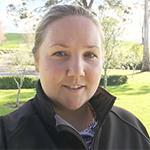 When I transferred to agricommerce I had the opportunity to move to Lincoln, closer to my hometown of Ashburton. I stayed at Massey because the degree is well respected in the industry and the Palmerston North campus is beautiful. It was hard work, but worth it. I enjoyed the course variety and the lecturers were always on hand for help, especially when you wanted to learn. I particularly enjoyed my honours year - it cemented the past three years and extended my thinking. I was on the Young Farmers Club committee for three years. The club organised professional development workshops giving students the chance to meet industry leaders and decide where they wanted to end up after completing their degrees. I started at Landcorp Farming as a Business Analyst, and am now a Business Manager. My role is varied and exciting. It ranges from shed and house procurement, project management of irrigation builds, farm systems reviews and changes, and business management of farms, to helping grow people and attending field days. In 2017, I’m taking part in the Kellogg Rural Leadership programme and at some stage I’m hoping to get into leadership roles within the primary sector. You will gain a grounding in agricultural/horticultural production combined with a blend of analytical and problem-solving tools, international business skills and entrepreneurial thinking. From running large farm-based agribusinesses right through to international food trade, you will gain the skills and sound business knowledge to help progress the future of New Zealand’s primary production sector. Your understanding of farmers and farming systems is also invaluable to firms selling products and services to farmers and those purchasing product from farmers so you could be working as a rural banker, a procurement agent or for a regional council.